The term “natural childbirth” or “natural labor” can have a variety of definitions, depending on whom you speak with. I believe that NATURAL means NOTHING. It does not exclusively refer to pain management. This means no induction i.e. sweeping membranes, foley bulb, artificial rupture of membranes (AROM), Pitocin, I.V fluids etc. Your baby comes when they are ready with no pokes or prods whatsoever. The way nature designed, the way God intended. The term “natural birth” has also been termed “pure birth”. God, the Creator of the heavens and earth, designed our amazing bodies to nurture, develop, labor and birth children. What an awesome privilege to experience pregnancy and to bring a beautiful child into this world. A passage from being a woman into motherhood. For thousands of years women have been birthing babies. Trust in Him. Trust you body in birth. You can do it. In the United States, our cesarean section rate has raised to an historical, astronomical high of around 35%. Medical interventions and maternal mortality have risen, since our model of care has shifted from the home to the hospital. At the hospital, understand that the sand-filled-hour-glass is turned over once you walk through the door. The scenerio 5 times out of 10 typically plays out as follows: Woman admitted to hospital. Woman induced. Woman receives Pitocin to increase and strengthen contractions. Woman receives epidural to cope with contractions. Woman put on oxygen due to fetus in distress. Then the woman either ends up getting vacuumed or forceped or ultimately c-sectioned–because 1. she does not have enough sensation to push effectively–ineffective pushing exhausts woman or 2. epidural stalls labor or 3. has a malpositioned baby or 4. fetal distress brought on by the induction and Pitocin or 5. all of the above! I’ve seen it over and over again and it’s heartbreaking. Be educated. Be well prepared. Take childbirth classes that prepare your mind AND your body. (See Resources section.) Be well informed of medical interventions. Please also understand you need to be flexible and fluid with your birth plan. Only God knows how your birth will play out. Complications are rare in labor, but if you have a basic understanding and knowledge of variations from the “norm”, you will better be able to make decisions accordingly. 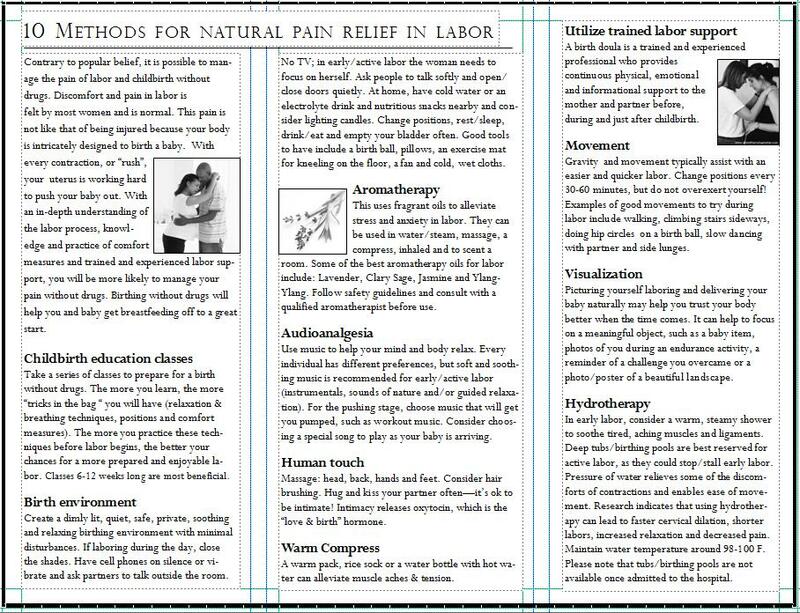 10 Methods For Natural Pain Relief In Labor. (Click on to enlarge).